Nugget & me on 1st trip to N.C.
My story is simple; I'm 61yr, single, the home payments were for a mortgage that was more than the house was worth, my youngest son was off to grad schools to get his doctorate and it was just me and Nugget (my Golden retriever) in a 3-2 house with pool headaches and all. 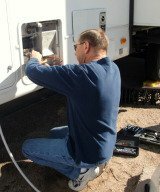 So I started researching RVs as a cheaper, simplified and less cluttered domicile. Here's where the title comes in. Until I got into the process of finding an RV for me, I didn't realize how wimpy my 7000lbs towing package was. 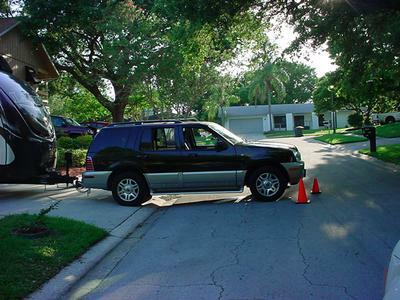 I have a 2003 Mercury Mountaineer with a V8 and their top end tow package - Not big enough! 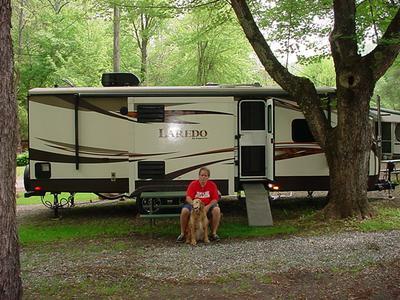 However, for the size of my vehicle I was still able to get a nice 30' Keystone Laredo and I LOVE IT! Though I do know that as a long term abode, it could get to feel smaller and smaller AND I do also miss my wood workshop/garage. So with this "new" information, my future plans are altered a bit. Step 1 - get a BIGGER tow vehicle. 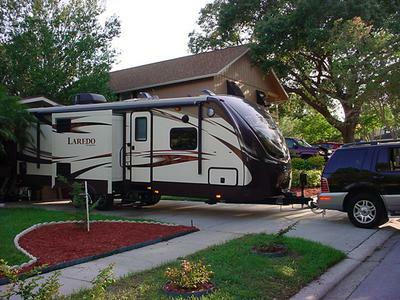 Step 2 - get a BIGGER 5th wheel RV - maybe with a toy box on the end. Step 3 – THEN pay down all the other bills! I do feel better without all the clutter which amazingly amasses over time. Though I have to admit, I do have a 10x10 storage unit with my shop tools and other items. It's hard to just let go of some stuff.